Anyone care to guess what models might be available?? Will it be streamed online ? 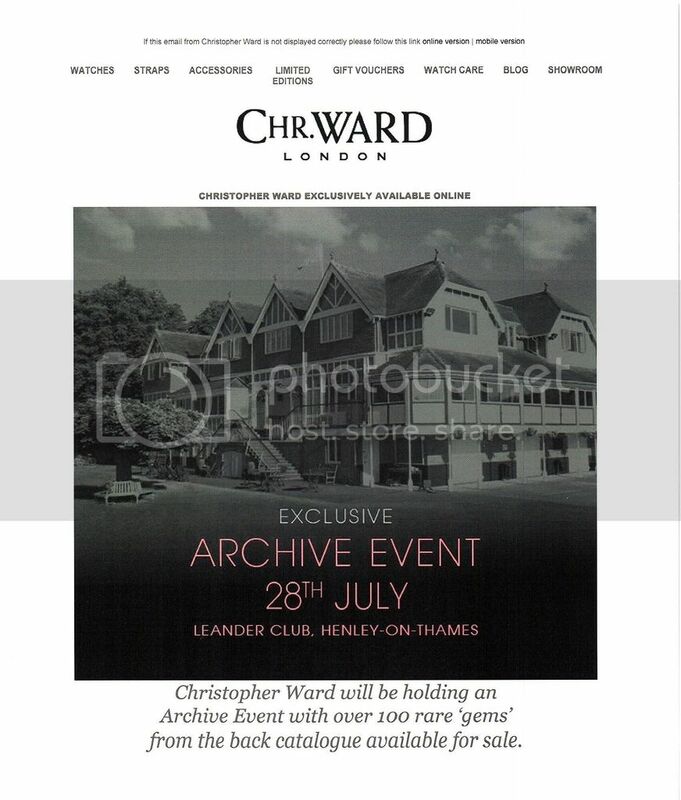 At 7.30pm an auction of 10 serial #1s from the first 10 years of Christopher Ward will be held. I think they are trying to keep out the weekend rif-raf. Kip wrote: I think they are trying to keep out the weekend rif-raf. PS> My email has just landed. Sounds like Wera is getting a new sofa! I have put my name down. I will see if I am home that evening. Maybe they've heard about your shoes? Would like to go but too close to my holidays funds wise for traveling and a purchase..or two! Funny that you should mention them, a splendid idea! Certainly is an "exclusive" event.... given the timing and location. Yup. I guess the number of watches in my collection of original-logo CW's is destined to stay at 1.